Ottawa is a nice city to visit, and we like heading to downtown when we're here. Our son has an apartment right in the center, and he was going away for the weekend with his girlfriend to her parents so he let us stay at his place for a night. Unfortunately, it wasn't the nicest afternoon! But, as my father used to say, the only thing you can change about the weather is your attitude towards it. So we went out in the drizzle and wandered around. Lots of other people out enjoying the day at Parliament Hill! Sorry for the raindrop on the camera lens! The Ottawa Tulip Festival is on right now. In 1945, the Dutch royal family sent 100,000 tulip bulbs to Ottawa in gratitude for Canadians having sheltered the future Queen Juliana and her family for the preceding three years during the Nazi occupation of the Netherlands in the Second World War. The most noteworthy event during their time in Canada was the birth in 1943 of Princess Margriet at the Ottawa Civic Hospital. The maternity ward was temporarily declared to be Dutch territory by the Canadian government, thereby allowing Princess Margriet's citizenship to be solely influenced by her mother's Dutch citizenship. In 1946, Juliana sent another 20,500 bulbs requesting that a display be created for the hospital, and promised to send 10,000 more bulbs each year. Since then, Ottawa has become famous for it's tulips and The Ottawa Tulip Festival takes place every spring around this time. There are over 1 million tulips on display around the city. We walked down to the Royal Canadian Mint. They do tours every day, and I haven't been in the mint since I was maybe 18 years old. But unfortunately, a lot of people were trying to do indoor things and all the tours for yesterday afternoon were sold out. So we wandered over to the Byward Market area. Lots of pubs in the Byward Market area of downtown Ottawa. The market is not nearly as interesting as the markets in Mexico. The Rideau Canal, and the old train station on the left. Changing of the guard at the War Memorial. We went back to the apartment to dry off and decide what to do for dinner. We always spend too much money when we visit Ottawa, so we were looking for somewhere inexpensive, which is tough to find. 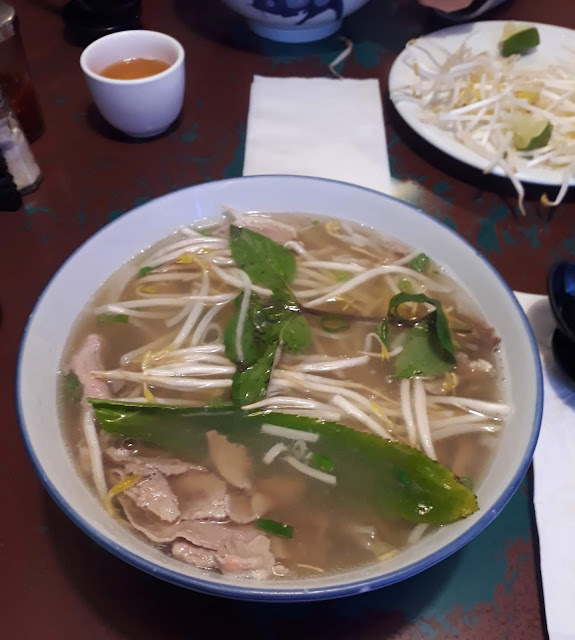 We drove over to the Chinatown area on Somerset St. and found a Vietnamese place for Pho that had good reviews. A big bowl of Pho for dinner. We each had the medium sized bowl and we were stuffed when we left. The bill was a reasonable $24.50 CAD ($19.25 USD), tax and tip included. Today, the skies are trying to clear up, so hopefully we'll get some better tulip photos for you this morning. Then, we have lunch with my mother and two sisters at 12:30pm, and afterwards we'll head up to Ruth's father's place for a couple of nights. Great deal on the highly rated Sunjoy Zero Gravity Chair. All six colors available at this price! Which pho restaurant? Pho Tu Do? Yep... that's the one! It was great! Kevin your camera takes such crisp sharp pictures....thanks for the pics as we lived most of our working lives a short distance from there. You didn't get a picture of the NAC ! No, and we walked right by it. We should have gone inside, I suppose. I like public spaces that were built when people and not cars determined how public spaces should look. I like old neighborhoods. We agree but somehow or other they always find a way to get the cars in or around those public areas. We love the old neighborhoods too, the houses are wonderful to look at and so many of them have been fixed up beautifully, they have so much more character than the new ones that they build these days. A nice tour of the capital. There is indeed a special relationship between Canada and the Netherlands. A new type of tulip has been created, it is white with red flames representing the Canadian flag... Craving a bowl of Pho now. The new tulips show in your second photo. Yes, we saw quite a few of those new tulips around and yesterday we even saw some very different tulips, they almost didn't look like tulips except for their leaves giving them away. Wonderful, as always. Thanks for the tour. I love how you add information, independent of your pictures. In this case, the story about Queen Juliana and the birth of Princess Margriet in the "Dutch" hospital. This American didn't know about that. That bit of history is actually the main connection as to why Ottawa has so many beautiful tulips around. It is such a pretty sight to see. When I saw the header pic, I just knew that was a train station. The architecture of the day over 100 years ago. Magnificent buildings. Ottawa city council has made a lot of blunders over the years, but the worst ever was moving the train station from downtown to the (then) suburbs in 1966. We love Ottawa! Miss that beautiful city hope we will get back there again one day soon. Glad you enjoyed your dat despite the weather. Enjoy your visit with family it may be awhile before you see them again when your on your next adventure. I'd really like to see/spend time in Ottawa. Your pictures make it look like a great town (city) to visit.